Manchester’s been hit with a triple whammy of venue closures within the last few months. 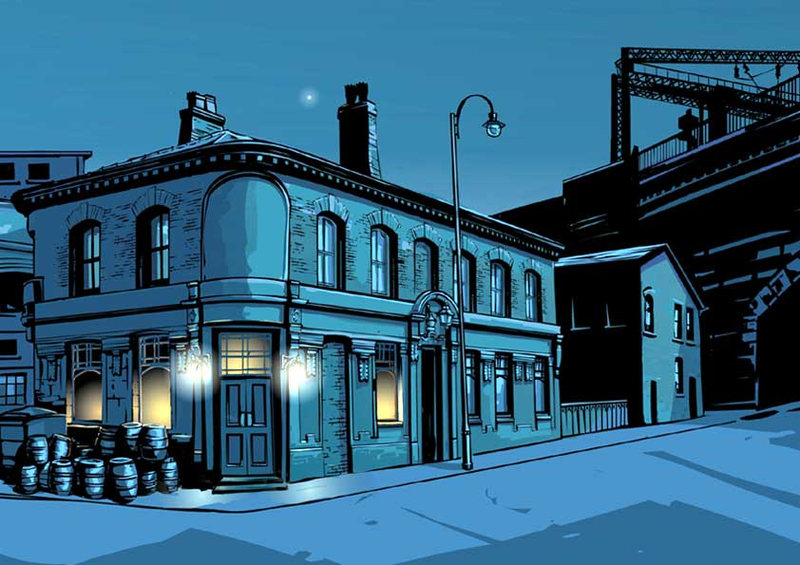 Three iconic ale houses have shut up shop across the city – each of them had diversified their efforts to stay afloat. Oxford Road’s Jabez Clegg and The Lass O’Gowrie and Chapel Street’s Black Lion have, or will shortly, close their doors for the last time. But the closure of these and struggles of other venues indicates a worrying trend. The story began back in November when student nightspot Jabez Clegg abruptly closed its doors after being sold to Manchester University for expansion of their biomedical campus. XS Malarkey, the nationally famous comedy club run by Toby Hadoke was uprooted having only just established itself within the venue. Financial pressures were blamed for the sudden and abrupt closure – one that came as much as a shock to staff as well as punters. But then, later that same week was the news that Salford’s Black Lion on Chapel Street was also to shut its doors. The Black Lion, famous for the first ever performance from Salford poet John Cooper Clarke (and whom the pub’s theatre space was named after), had been making a name for itself thanks to the broad range of events held there. Chapel St. Studios, helmed by Jenny Trethewey had been putting on exciting and risk-taking events ranging from music to slam poetry nights and new writing from local theatre companies. Landlord Jenny Inchbald put the blame on “incredibly unhelpful” landlords – a trend that continues with the Lass O’Gowrie’s closure. I’d had many a fun and welcome night in The Black Lion, and seen some entertaining theatre. Some excellent, some not so good events – but events that were always innovative and pushing the envelope, backed up by tasty real ales. Now, the latest casualty of the brutal and throttling grasp of the Pubco’s is the Lass O’Gowrie, a long held favourite haunt of this blog. The Lass’s last hurrah is this Saturday, with a car boot sale selling off many of the Lass’s knick-knacks. The Lass’s legacy has been to enhance and up the game on pub theatre with ambitious adaptations of Coronation Street, Doctor Who and comic favourite Halo Jones amongst rarely seen drama like The Best, Hot Fat and Wine of India. The vibrant pub theatre scene came after the creation of numerous diverse groups. From the Lass’s book group, to the nationally famous Computer Club and the ever growing Doctor Who community and convention scene that had been established saw the Lass O’Gowrie become a shining beacon amongst Manchester’s hidden gems. It even caught the attention of Cosgrove Hall animators in a 2003 animated version of Doctor Who. 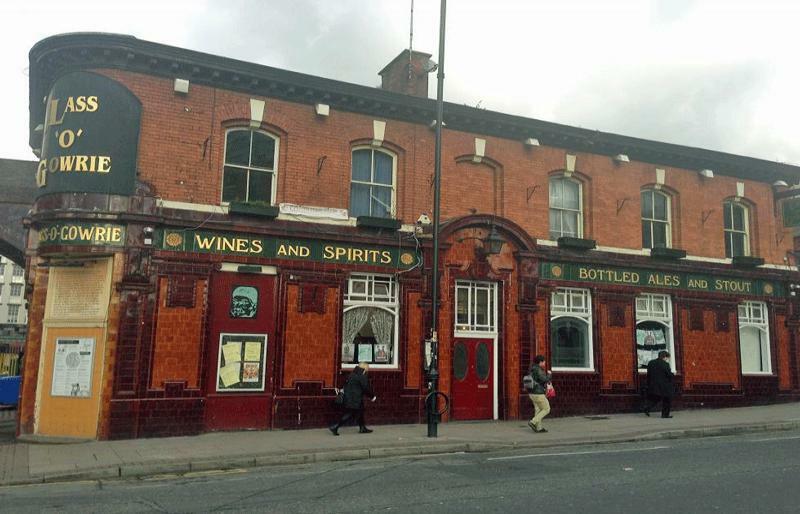 The closure of BBC’s Oxford Road site hasn’t helped the pub – and landlord Gareth Kavanagh has now spoken out about the intolerable pressure facing him, and no doubt other landlords. The Lass O’Gowrie’s brewery, Greene King, considers the pub to be under-performing according to its location. After the BBC’s closure, Kavanagh requested a rent review, a move refused by Greene King. He then become embroiled in a two-year battle to reduce rent. Subsequently winning an independent review, Greene King then enacted a clause in the lease enabling them to charge Kavanagh for a review of the pub – with a bill for renovation works to be footed, a move Kavanagh is now speaking out about. This may be a sadly familiar story to many landlords up and down the country – except the Lass O’Gowrie is a multiple award winner – and The Great British Pub of the Year 2012. Despite this accolade, Greene King were still unconcerned about the pub’s survival, and viewed Kavanagh’s unique mix of events designed to turn the Lass into a destination pub as irrelevant and secondary to the main objective of the pub – sell beer. Despite much critical acclaim, and busy ringing tills whilst events are on, none of this trio of venues has managed to stay afloat. Breweries do not understand the subculture that has sprung up around these venues. People just aren’t coming out anymore – there needs to be a reason to come out and drink in your boozer and the Lass O’Gowrie had hit upon that formula. Nearly every single night the Lass team pushed the boundaries, or provided like-minded folk to talk to. Kavanagh’s relentless determination has most likely kept the Lass O’Gowrie afloat for longer than it would have done without his unique programme of events. The Lass O’Gowrie’s strength was in welcoming anyone, no matter what background. Whether it be Doctor Who fans in one corner with United and City fans mingling in another – or dissemination of a Fringe theatre performance, it’s been a tremendous place to soak in a cultured atmosphere with people outside of your usual sphere. By the end of the weekend, I will have lost my local. With no disrespect intended to any new owners, I won’t be setting foot in the Lass O’Gowrie ever again. Neither will I touch a drop of ale from Greene King either. Such gestures may be viewed as petty, but I’ve spent much of the last five years making good friends, seeing wonderful events, playing retro computer games and being shocked, amazed and astounded by some of the theatre. That will be gone and with it, for me, much of Manchester’s heart and soul. An ongoing battle to maintain a beating heart of Manchester’s diverse culture scene has been lost, but the war continues. The Greater Manchester Fringe, co-directed by Lass luminaries Gareth Kavanagh and Lisa Connor will return in July across several new venues with promises of the third round of Coronation Street Live and Corriefest. The Eagle Inn will pick up the baton from the Black Lion and is one of the new homes for Chapel St. Studios. Other venues including The Kings Arms, Three Minute Theatre, Fab Café and The Salford Arms continue to keep Fringe alive and kicking in Manchester. The human cost is another dimension that affects every pub closing, no matter their size. The Lass O’Gowrie is making 10 staff redundant and Kavanagh himself will bear “significant financial penalties” in a situation repeated across Manchester and the UK. Some of the Lass staff are friends, thanks to their good humour and hospitality, and it’s very unpleasant to have to see them join an ever growing pool of unemployed. Hopefully they’ll all manage to secure positions at other venues. I’ll end with a heartfelt thanks to the landlords, managers, staff, cleaners and anyone who has ever been involved with Jabez Clegg, The Black Lion and especially The Lass O’Gowrie. Thank you for your belief in new, exciting and different events. Without them, I wouldn’t be blogging, nor would I have had the most wonderful two years reviewing shows at your venues. But especially, I’d like to thank Greene King for their narrow-minded, mercenary and petty behaviour. Thank you for ruining my local, and most of all thanks a bunch for scattering one of the richest communities I’ve ever had the pleasure to be part of. This is a post I wished I’d never have to write. Fringe is at its most vibrant in Manchester, possibly at it’s most vibrant countrywide. But without the support of the breweries to help venues diversify and stay open, no doubt there will be more landlords forced to shut up shop. As I write this, it seems that a village pub in Cambridge is the latest to suffer at the hands of Greene King. Could your favourite pub in town be next? If you like it, support it and as many events as you can. You never know if your favourite might close its doors as sharply. If you’ve ever enjoyed any event at the Lass, or the Black Lion, then please support the Greater Manchester Fringe in July. Please don’t take it for granted that there will be a 2015 Fringe, or Nowt Part Of, or 24/7. They all need your support. It’s important for landlords to be brave enough to speak out about their experiences with Pubcos. The Lass O’Gowrie team worked their socks off to provide for their community. That hard work is rewarded with a long lasting legacy of energised Fringe creators, writers, technicians and producers, all of whom are set to see the venue off in style. And if the uproar on Twitter is anything to go by, Greene King might just have lost a lot of customers. The show goes on in 2014, but it won’t be the same. Please also be sure to support the Fair Deal for your Local campaign for pubco reform at http://www.fairdealforyourlocal.com and http://www.facebook.com/fairdealforyourlocal. The campaign is backed by a widespread coalition of groups representing licensees, consumers (including CAMRA), trade unions including the GMB and small business organisations the FSBand FPB. A Government decision is imminent on whether to legislate against pubco abuse. Thanks for your comment – and a timely reminder about support for your local. I’m only just opening my eyes to all the options available to help support your local. Having lost one, I’ll be damned to lose another. I live in (the faint) hope a Government decision will help ease pressure on this sector. I take on board most of the points you make. However, there was no mention of how pubs close-by could have been affecting the business of the pub. Pubs that maybe doing well and taking a chunk of their passing trade. Could this have been a factor? It’s a good point, and one I can’t entirely answer. Possibly Factory opposite has took some of the student trade away – but they open later so I don’t know if that follows through. There’s Joshua Brooks adjacent, but I rarely go in there personally, but it seems to be always fairly busy when walking past. One problem is that the closure of the BBC and other business (UMIST, other ones on Charles St.) mean that passing trade appears to be rare. Within a 5/10 minute walk, you’re suddenly in different areas of town, i.e. Temple, Rain Bar, Peveril territory, or up to Odd Bar/Footage/Sand Bar – most of which are student focused. With the closure of other businesses – it simply had to become a destination pub – something I think that the Lass team did very well. Lord only knows how the next tenant will fare. When I heard the news yesterday my first thought was that it must have suffered from the closure of the BBC, but also that the landlord seemed to be doing what needed to be done to keep people coming in. You’re also right about the choice in the area – Manchester city centre is so small that it’s easy to walk around and find a place to drink. However the dead hand of Greene King’s number crunchers has done it again, all the more ridiculous when the pub has received accolades so recently. The stupidity is that it’s probably about the beer that they are forced to sell, and buy at a premium from Greene King – guest ales don’t count, and food and tea and coffee and soft drinks don’t either, so to some dull eyed manager in Bury St Edmunds, the pub isn’t performing. The pub might get a new landlord for a while, but in this sort of situation they fall into an 18 month cycle where a new victim comes in with no budget to make changes and no strategy to get people through the door, and come their second review they are out. And then another victim comes in, and then another, until eventually there are no more. I used to love going in the Lass. I wonder is there enough people who liked the lass to crowdfund money to buy it from greene king and issue shares to those that put money forward and run it as pub co-op? The pubcos have systematically destroyed the Great British pub through charging their tenants up to double the going rate for beer and setting rents at such a level they make pubs completely unviable as standalone businesses. Good intentioned tenants with little or no experience are sold a dream and enticed into pubs by the lure of riches. Sadly, it almost always never works out that way. By borrowing money from friends or investing their life savings they may succeed in increasing the pubs turnover but the brewer/pubco usually has their hands firmly in the cash drawer so the tenant never see’s any of it. 18 months later they are destitute, bankrupt, out on the street and the pub has a new lamb for the slaughter – and so the process begins again. This wilful, premeditated destruction of Britain’s pubs is nothing more than a property play by the pubcos and brewers who can realise more money by selling their pubs to McDonalds or Tescos and it’s the whole community that suffers. Government are currently looking the sector buts it’s likely they’ll be persuaded to do nothing by their rich brewing friends in Burton and Solihull who have all but sucked the life out of Britain’s pubs. The Neames, Wells’ and Youngs’ are some of the richest land barons in the country but they’ll cry foul should Government attempt to haul the sector into the 21st century. The beer tie has kept them in dinner parties and riches so they don’t want their Tory mates to rock the boat.